Global e-Learning Market Research Report 2021 (By Technology, End User and Geography) | Market Research Reports® Inc. Global e-Learning Market Research Report 2021 (By Technology, End User and Geography) report is published on September 12, 2017 and has 121 pages in it. This market research report provides information about Business & Government, Education, E-Learning, Internet Education, K-12, Technology (Education) industry. It covers Global regional market data and forecasts. It is priced starting at USD 4,500.00 for Single User License (PDF) which allows one person to use this report. E-learning is the rapidly growing market as education sector is actively increasing use of eLearning services due to its affordability, accessibility and mobility. E-Learning is also extensively used by corporate for training and development because of its low cost compared to the traditional training and availability of the high amount of quality content. Furthermore, governments and Public organizations are also utilizing e-Learning for the development and educational purposes. Global E Learning market has grown rapidly in last five years with the staggering CAGR growth of 18.15%. Major driving factors for the E Learning market has been increasing expenditure on education, increasing digitization, ease of accessibility and rapidly emerging markets of emerging countries. Currently, North America and Europe have the largest user base for E-Learning customers and almost all the big players in the industry are from this region only. Though markets of North America and Europe are not the fastest growing as they have already achieved maturity. Asia Pacific and Latin America are the third and fourth largest player, which are increasing at the above industry growth rate. E-Learning market is constantly evolving and shifting with the improvement in technology and new platforms. If the pace of innovation is not matched survival is very hard in this industry. Currently, Trends like cloud-based platforms for LMS, Mobile Learning, Gamification and personalized learning are driving the growth of the market. This new development has led to decline in the Self-paced learning, which consists of number large portion of the eLearning market with a high number of players. 8 major companies have been covered in this report for accurately studying the market and understanding the need of the market, and to determine the growth drivers and inhibitors and trends followed in the Global E Learning Market. This report provides a detailed view of Global E Learning Market. This report identifies the need for Global E Learning Market. This report provides detailed information on Global E Learning Market, with growth forecasts up to 2021. The report identifies the growth drivers and inhibitors for E Learning Market. in world. This report profiles top eight players related to Global E Learning Market. This report provides detailed competitive landscape of Global E Learning Market. This report identifies major challenges faced by a new player in Global E Learning Market. The report identifies the key risks associated with Global E Learning Market. 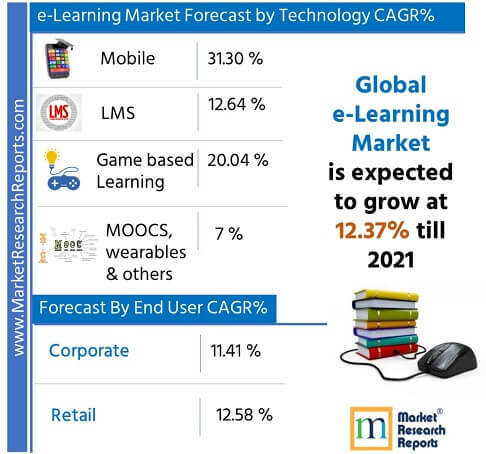 This report provides future trends for Global E Learning Market. This report also provides recommendations for policy makers and investors and helps other players sustain in this market. 7.1 APOLLO EDUCATION GROUP, INC.
7.1.3 Financial Performance of Apollo Education Group, Inc.
7.2.3 Financial Performance of NIIT Ltd.
7.3.3 Financial Performance of Pearson PLC. 7.5.3 Financial Performance of Adobe systems Inc.
7.7.3 Financial Performance of Blackboard Inc.
7.8.3 Financial Performance of Instructure Inc.
Exhibit 7.1.1 Company Profile – Apollo Education Group, Inc.
Exhibit 7.1.2 Contact Details – Apollo Education Group, Inc.
Exhibit 7.1.8 Major Products and Services of Apollo Education Group, Inc.
Exhibit 7.1.9 SWOT Analysis of Apollo Education Group, Inc.
Exhibit 7.2.1 Company Profile – NIIT Ltd.
Exhibit 7.2.2 Contact Details – NIIT Ltd.
Exhibit 7.2.8 Major Products and Services of NIIT Ltd.
Exhibit 7.2.9 Business Mix of NIIT Ltd.
Exhibit 7.2.10 SWOT Analysis of NIIT Ltd.
Exhibit 7.3.1 Company Profile – Pearson PLC. Exhibit 7.3.2 Contact Details – Pearson Plc. Exhibit 7.3.8 Major Products and Services of Pearson PLC. Exhibit 7.3.9 SWOT Analysis of Pearson PLC. Exhibit 7.5.1 Company Profile – Adobe systems Inc.
Exhibit 7.5.2 Contact Details – Adobe systems Inc.
Exhibit 7.5.8 Major Products and Services of Adobe systems Inc.
Exhibit 7.5.9 SWOT Analysis of Adobe systems Inc.
Exhibit 7.7.1 Company Profile – Blackboard Inc.
Exhibit 7.7.2 Contact Details – Blackboard Inc.
Exhibit 7.7.8 Major Products and Services of Blackboard Inc.
Exhibit 7.7.9 SWOT Analysis of Blackboard Inc.
Exhibit 7.8.1 Company Profile – Instructure Inc.
Exhibit 7.8.2 Contact Details – Instructure Inc.
Exhibit 7.8.8 Major Products and Services of Instructure Inc.
Exhibit 7.8.9 SWOT Analysis of Instructure Inc.